Who the heck, thought of making a CARROT, taste just like a HOT DOG? Well after seeing all the hoopla last year I finally tried my hand in making some….. and DANG are they good! You gotta try my new Smoky Vegan Carrot Dogs! They’re INSANE! I mean really….how in the heck can a CARROT…. of all things… taste like a hot dog?! But I will admit, they WOULD be convenient, for say, a 4th of July picnic, where there will be people grilling burgers & hotdogs…right? Now you can fit right in….as long as they taste good that is. Well make no mistake…. these Smoky Vegan Carrot Dogs DO taste good. But it’s weird…..the whole time my mouth is saying “man, this is one great hotdog”….my EYES are seeing a stupid carrot on a bun. It’s just CRAZY….. but it works. 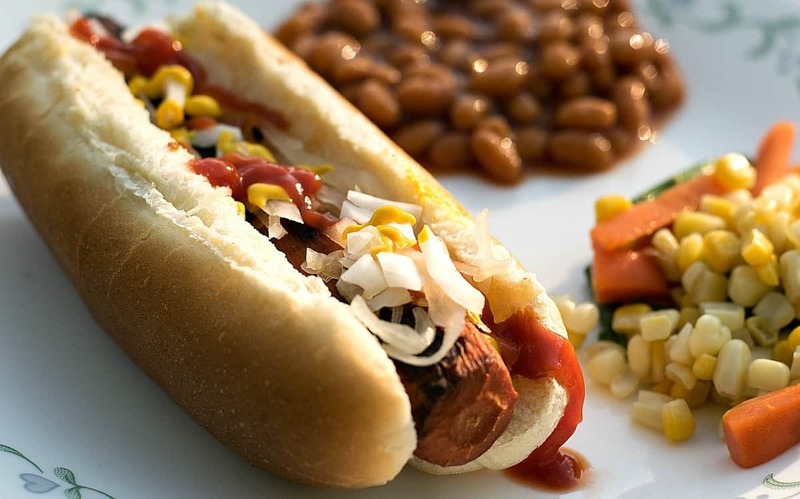 I know I’m a little late to the whole ‘carrot dog’ party, but I knew this holiday weekend people are going to be asking for them, so I might as well come up with my own recipe. And what I did was scour the internet, looking at many of the various carrot dog recipes (and there are LOTS), and kind of made a mental list of what seemed to be the key ingredients…..soy sauce, liquid smoke, vinegar, etc. and made up my own recipe using what I thought would taste good, including a few ingredients none of the others had…..
Well all I can say is I am dang impressed. My very first try and both of us were running back for seconds. And it’s a CARROT…..that happens to taste like a hot dog. Peel your carrots and place them in a pan of water. Bring to a boil and simmer them just until they are fork tender…..about 10-15 minutes. We do NOT want mushy dogs here, just tender enough to push a fork through. Drain the carrots and rinse really well with cold water (so they’ll stop cooking). Drain again and place them in a ziplock freezer bag. For the marinade, whisk all the marinade ingredients together until well blended and then pour that into the bag with the carrots. I used soy sauce, apple cider vinegar, veg broth, and liquid smoke – as these seem to be the key ingredients. I also added a teaspoon of minced garlic (fresh, not the powder), a teaspoon of yellow mustard, and a teaspoon of my secret ingredient….pickled jalapeño juice. All those ingredients are pretty acidic, so to balance that out I wanted to use a little sweetener. I had Maple syrup in my fridge, so that’s what I used. You could probably use date syrup too if you choose, or agave – but I can’t guarantee the results. Seal the bag and place it on a plate in your fridge. Let that sit and steep for about 6 hours. Remember to turn the bag over occasionally to keep things mixed up. You can speed this whole process along by using your Instant Pot! Simply add your raw carrots and marinade to your Instant Pot and cook on MANUAL for 3 minutes. I did a Quick Release to release the pressure – and then just left my carrots in the pot until I was ready to grill that afternoon. SUPER easy and saved a LOT of time. PS. I would still marinate the carrots in the IP after cooking for at least an hour for maximum flavor. And then to cook your dogs I did what any guy would do on a 4th of July weekend….I fired up my trusty grill. Can you bake these? Don’t know. Can you pan fry them? Don’t know. Can you microwave them? Don’t know. I grilled them and they were awesome. I also basted them occasionally with my remaining marinade to keep them ‘juicy’…..because…well….. they’re carrots. There’s not going to be any fat sizzling down into the flames. I just grilled them long enough to get some blackened char, those lovely grill marks we love so much on several sides. WTH!? Is he grilling CARROTS? Yep. Life of a Vegan. But man…….. when you put these babies on a bun, with a little mustard, ketchup, sauerkraut, maybe a little chopped onion…. Don't you just hate Summer Picnics where everyone is grilling burgers and dogs? Well take these Smoky Vegan Carrot Dogs and join right in! Cut and peel carrots to make them "bun length'. Boil carrots in water until just fork tender. About 10-15 minutes. Drain carrots, rinse with cold water, and drain again. Place carrots in a ziplock freezer bag. Whisk all marinade ingredients together and pour into bag with carrots. Grill carrots on an open grill, basting occasionally. Grill to heat all the way through and to get some blackened grill marks on each side. Add cut carrots and marinade to Instant Pot. Attach and seal lid, then cook on MANUAL for 3 minutes. After doing a Quick Release you can then leave the carrots in the pot until you are ready to grill. I would marinate the carrots after the pressure has been released for at least 1 hour. If not grilling soon - remove carrots and marinade and transfer to a container you can store in the fridge. Garnish with your favorite Hot Dog toppings. Goes great with my Vegan BBQ Beans, Vegan Potato Salad, or Vegan Pasta Salad. I’ve had carrot vegan dogs before that were not very appetizing, but I don’t think the carrots were cooked the way they should have been. Your recipe looks like a winner, though! 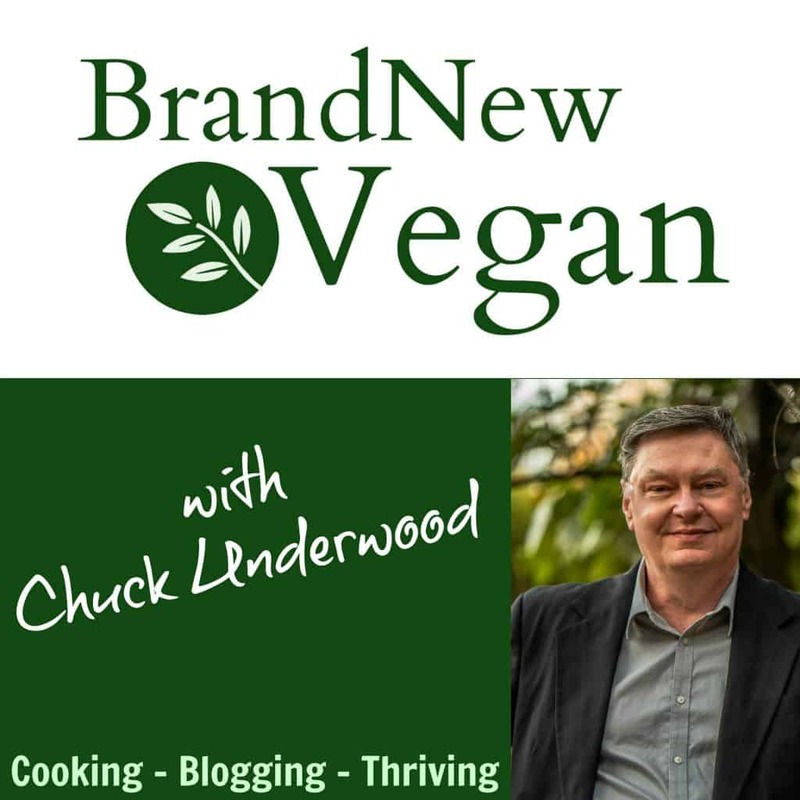 I’m not vegan, but I have a LOT of vegan and vegetarian friends and we’re always trying to find new recipes for when we entertain that will appeal to everyone. This looks like a great one to try! 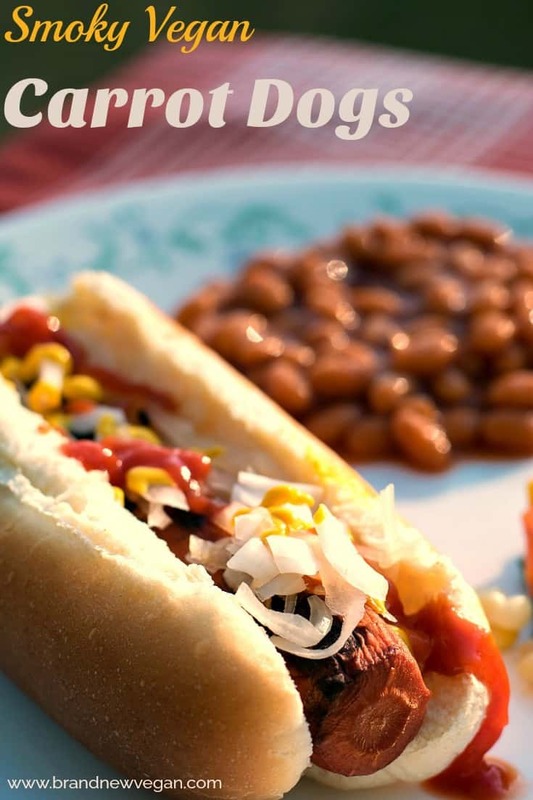 What a great idea for vegan friendly BBQ fare! Just curious…..how long did you marinate them? New here. Can’t seem to find the ingredient proportions for the marinade. I have everything. I am so curious! I can’t wait to try these. Veggie sausages bought from the store end up being really expensive (and SO SALTY). I’d love an alternative. But did you try the carrot dogs? Just curious: Could you put the marinade in the bag with the carrots and then freeze it.. then move it to your fridge to thaw and Marinate when your ready to use them? I suppose…..I’ve never froze carrots before…..but it sounds like it would work. Derek Jones, if you freeze fully cooked carrots, they will be mushy. Try cooking them only about half way before you freeze them. Just tried this, honestly, it’s not going to be my new thing. To me, it still tasted like a carrot and not at all like a hot dog. The right flavor just wasn’t there or it wasnt strong enough. I can’t really understand all the rave reviews. I agree with you Buff Cree Barr. I was not impressed. I marinated for at least 6 hours. Mine never reached the dark color and I had them on the grill for quite a while and basted frequently. I almost think that a ridged cast iron grill pan would be better for cooking so the juices stay on the carrots a bit. The flavor was pure carrot. Disappointing. Made these. SO delicious! Everyone kept commenting in the aroma as they cooked. They smell just like hot dogs. I don’t really eat soy so it was a treat to have something that tasted so much like the real thing. Thank you! I can’t imagine this working! I just can’t. hahahaha. I am NOT a fan of carrots though. mmmm, okay. will have to try and see how it goes. thank you for the recipe! This recipe was EXACTLY what I needed. I doubled it, left out the veggie broth and jalapeno sauce, and made two 8 packs of carrot 🥕 dogs. If you want to cook em on the stove, let me suggest simmering them just about 3 or 4 min longer in that initial step so that way, you’re really only heating them in the pan. Heat them in a little of the marinade just till warm. We had em with all the fixings, and we all couldn’t believe how good they were. Thanks for this recipe. Oh. My. Word! These were a huge hit for my family of 7. They eagerly asked for me to make them again–soon! The only thing I did differently was instead of the pickled jalapeno juice, I subbed white vinegar. As baby vegans, these tasted just like hot dogs, and much better than the fake meat versions! Thank you so much for sharing this recipe! I will definitely recommend it to EVERYONE I know! I LOVED these! I’ve been curious about carrot dogs for a while now. I looked over a few recipes and decided to go with yours and I’m so glad I did. I was going to leave them marinating overnight, so I cut the ACV to half. I used garlic powder just because I was lazy. I used honey (not vegan, I know) because I didn’t have any maple syrup. I cooked these on the stove in a cast iron skillet, letting them char just a bit. My husband had 2 with mustard and ketchup. I had 1 with mustard and ketchup and 1 with mustard and sauerkraut. We used plain, generic hotdog buns. They smelled so good while cooking and tasted just as I’d hoped. While they obviously do not have the same taste and texture as a hotdog, they were close enough and delicious! My husband could not stop raving about how wonderfully weird it was eating a carrot on a bun. Well done! 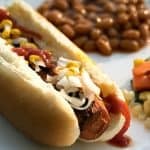 I adapted your mokey carrot dogs for Instant Pot and make a batch weekly. Instead of piercing and marinating the carrots, I simply make a double batch of marinade from the recipe and submerge 8-10 med sized carrots in the liquid in the Instant Pot. Then I use the manual setting to pressure cook them for 2-3 minutes in the marinade and do a 10 min NPR. I do 2 min if carrots are more slender, 3 min if they’re thick. Initially I thought the vinigar was a bit overwhelming but after trying variations decided iyour original does the job splendidly. Thanks so much! These really fill a hole in my comfort food cravings. Hello We looked at similar recioes and created our own which works well for us. First we simply wash and cut off ends. Then we steam in Instant Pot for 7 min on “rice” setting. Then we take out and place on hot oiled griddle and sprinkle a little of this and that. Namely, celery seed, smaked paprika, garlic, onion, salt and cumin. Grill til charred a bit on each side and put on bun or bread with ketchup and mustard. We have 5 children who LOVE these! Thanks! Do you think instead of using liquid smoke, one could put the marinade in the smoker( my husband smokes other food) it would/could be even better or smoke the carrots? By all means, if you have a smoker, try it! Made these for dinner tonight. Everyone loved them. I’m not a vegan but I love hot dogs yet hate what they’re made of. Instead I just gave them up. Until I found this recipe. I’m in love! I can eat hot dogs again. I too cut the cider vinegar in half. It really is too much. And I skipped the jalapeño juice. I also used beef broth since I’m not a vegetarian. But these are delicious! I have to keep telling myself that its a carrot. So thank you for the recipe. I would love to be able to make these up and have them on hand, do you think these can be Jared and ke of in the refrigerator for any length of time? Not sure – maybe a few days but I get nervous after a while. I really enjoy your recipes, I’ve tried quite a few and recommended them to friends. I had my doubts about these, even when making them, but ever since going veg I have craved hot dogs with a hearty dollop of guac, mustard, and sauerkraut, and soy dogs did not do the trick. I did these carrot dogs the laziest way possible: I marinated them in the same pot I boiled them in, then (since I don’t have a grill) I brought them to a simmer in the marinade until heated through. I am converted! Even my meat eating partner who loves hot dogs gave me the nod of approval. Chuck, you’ve done it again! I actually made the “dogs”. Science, I guess. Outstanding. Put catsup and hot sauce on-no difference to a regular hot dog. Totally amazing. A must try. Not kidding. I accidentally left the “dogs” in the marinade in the fridge overnight. Not sure if that made a difference.. Thanks, Chuck! Summer will be better, because of you. Would it be possible to leave out the liquid smoke? Or would that completely change the flavor? I have heard some questionable things about liquid smoke, so I just wanted to ask. That would change the flavor. but I suppose you could try adding smoked paprika instead? I don’t normally leave recipe reviews, but these were really amazing. I didn’t expect much because there’s a reviewer saying she didn’t think they were anything special. I did about 2 Tbs of apple cider vinegar and used mesquite liquid smoke. I also browned my carrots in a frying pan, because I don’t have a grill. I used these for meal prep. I ate two carrots a day and left the others in the marinade. They didn’t over marinate and tasted great. Oh, and I’m a vegan BTW. I’m interested in trying these out for camping, but am wondering how to make them a bit more quick, camping-friendly. Can these sit in the marination for longer than six hours (think 24 hours or longer)? Or, alternatively, can the carrots be cooked, then set aside and added to the marination the next day without comprising the integrity of the carrots or taste? Either way, even if I can’t make it work for camping, I will certainly be trying this recipe at home! Sounds absolutely delicious and like a fun way to participate more in barbecued meals. I want to try making this carrot dog recipe, but I don’t like “smoked” foods. Should I just eliminate the liquid smoke, or does it need to be replaced with something else? Thanks for coming up with so many great recipes! Made these for Memorial Day barbecue and they were delicious! No carrot taste at all. I didn’t have jalapeño juice, but used spicy mustard. They’re great with sauerkraut! Thanks Chuck! I made a bunch of these for Memorial Day cookout. I marinated them overnight. We grilled them outside. They were so good! Put on what ever fixings you desire and enjoy! Will definitely be making these a lot this summer. I can’t believe how well these turned out. I would never have thought it could come this close to being a hot dog in fact it was better. These were fantastic! Thank you so much! I made these and actually stood at the grill and ate half the batch. I left the other to marinate overnight and cooked up in a cast iron frying pan …AHHHMAZING! Won over my daughter and I both! Definite keeper. Have not tried it on bread with the fixings, but once I find a gluten free bun I will!!! 5 stars! I have seen this recipe numerous times on various facebook groups I’m part of and always made a strange face when seeing these. I was skeptical to say the least! But after a few months of seeing this recipe go by, I decided to read the reviews. I was really craving hot dogs so I made these instead. OMG, I am so impressed!! They are the same texture and taste as a cheap brown hotdog. Mind blown! If you are on the fence about trying them – do it! You won’t be disappointed! Before switching to a plant based diet I was a hotdog FENATIC. I made one of these last night with some grilled onions, ketchup, and mustard. I’m in love and can’t wait to make more!! I used smoked paprika in place of liquid smoke and powdered garlic. I also left out the broth and jalapeno juice. I did not find the vinegar to be over powering. I left a little pop in my carrot too as I feared a mushy carrot. It reminded me of the little snap I used to enjoy when eating a hotdog. AMAZING! I used the Instant Pot steps and they really surprised me! I DO NOT like cooked carrots so I was very skeptical. The taste and texture was just like a hot dog! I don’t understand why you don’t just cook the carrots in the marinade. That’s what I do. They are tastier and it eliminates the step of boiling them first. These are awesome! Not vegan here, but the recipe intrigued me. My burly meat eating husband was amazed by how much these tasted like hot dogs. The only thing I changed about the recipe was that I pierced the carrots lightly with a fork so it could soak up more marinade and I used liquid aminos instead of soy sauce. Great recipe! Thanks for sharing! AMAZING!!! Made exactly as instructed, marinated over night, then grilled. 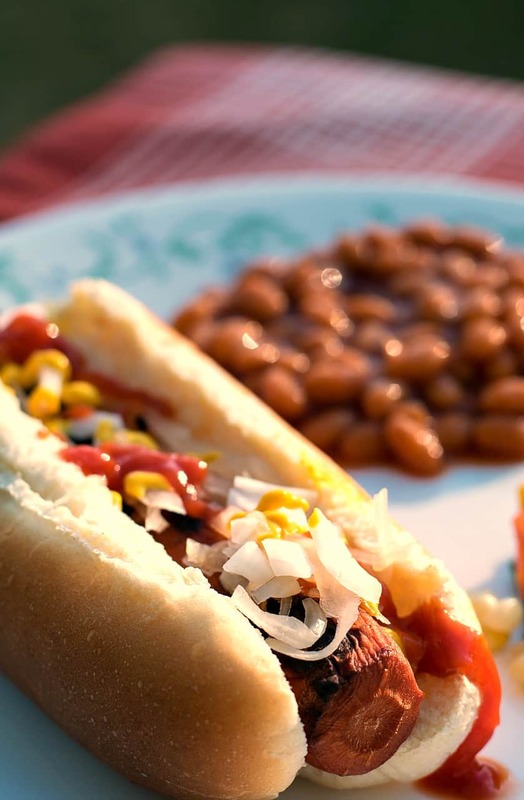 I absolutely loved these – they hit the spot just like a good ol’ hot dog! My nieces who enjoy eating veg gave them a 8 and 9 out of 10!! Oh my GOODNESS!!!! I’m so excited about how much I love these!!! I have missed hotdogs for years because (well they’re not really food) but the flavor of a hot dog is just something special. Now I can have them again!!! Yeah. I’m pretty much known as the health nut and this just elevated my status even further! WOW!!!! These are crazy good. Follow the recipe and you won’t be disappointed. Thanks Chuck, for such a wonderful recipe. I tried these and love them. I haven’t used the instant method yet. I keep a batch in my fridge for a quick lunch . I reheat in microwave and they are great. When I run out of carrot dogs. I cook a new batch and use the marinade again. It seems to keep real well. Love these. Thanks so much for the recipe. No quilt at all. I !!! LOVE LOVE LOVE !!! Carrot Dogs …I jumped on the Carrot Dog bandwagon as soon as they started circulating. I made them for my (non Vegan but very Vegan friendly and curious) family that whilst amused and thought I had lost the plot and always requested I make enough for seconds and thirds, they LOVED them too. But this recipe is NEXT LEVEL. I followed this recipe to a T and in my opinion did not need ANY alterations as it is perfect. Thank you, this recipe will go into my trusted “Tried and True’ recipe book and will be my go to for every time I make Carrot Dogs. I just have one question to satisfy my curiosity if I may ? I never peel carrots, I just top & tail, wash and slice off any undesirable bits on the skin (if any) … is there any real need to peel them for this recipe ? Nope – no need to peel f you’re comfortable with that. I do the same. All I can say is WOW! I’ve used to live in Atlanta and they had a place that only served hotdogs – a carrot dog was on the menu but I never tried it. Even though I am a vegetarian, I’m not a big fan of carrots – only as juice – so I passed on theirs and had the vegan field roast dog. Soooooo glad I found this recipe! I had most everything in my kitchen to prepare it – but had to get some liquid smoke and carrots. Had to settle for carrots that weren’t too think (I was hoping for 1 inch thick ones as that seemed right) but wound up with thinner ones. As it was a 2 pound bag, I prepared all the carrots as you mentioned – using the bun as my template – but decided to cook the whole lot of them – maybe 8 regular and 3 smaller ones in my InstantPot. Didn’t use the jalapeño juice as we don’t have pickled jalapeños here. Accidentally used 2 tbs of liquid smoke instead of 1 but the marinade was already made. Poured over the carrots in the IP, pressure for 3 minutes and natural release and them popped two of them on the George Forman Grill (its raining today) and served them in buns topped with sauerkraut! Well let me tell you! I WAS AMAZED! 1 – The size of the carrot was perfect – when it’s thicker you can taste a slight bit of carrot (not bad but you do notice). 2 – The texture was great – firm with a little push back when you bite, but thick and “meaty” when you chew. 3 – The taste and smell are amazing!!! I left the others to marinate in the IP bowl with the hot marinade, them packaged them up for lunches this week! I am so excited to have them again! So tasty, filling (but not heavy) and vegan! And the only really calories are coming from the bun! What a great find! Thank you so much for taking the time to get the right marinade and share with us! I’ll be checking out your other recipes for sure! I made 2 last night for myself and my meat eating daughter and husband each wanted to try a bite because they looked so good. Needless to say they each loved them and even asked if I had anymore made. My daughter said she will never go back to eating meat dogs again. They were insanely delicious! My husband said he would even eat them or a “real” hot dog any day. I used your recipe EXCEPT for the jalapeno juice–cause I didn’t have any, wow!!! these are delicious!! I know my grandkids would never know the difference. I just harvested the last of my carrots in the garden. I needed a vegetarian option for my daughter. I found this recipe and laughed..:but nothing ventured nothing gained. It was amazing! My husband had seconds! Served with homemade French fried and Cole slaw. A definite keeper. Thanks for a very creative and delicious alternative. I LOVE this recipe and have used several times in last year. I used all ingredients exactly as written but sometimes add just a little extra maple syrup. Always wanted to try “carrot pigs in a blanket” by wrapping small lengths of the carrot dog in Crescent Roll dough and baking. Tried it this week and they were fantastic!! I wish I could have posted a picture because they were cute! You’re a genius! I’m trying this tomorrow! Just thought of this, I Can a lot of Veggis so I’m going to look into Canning these! Talk about a long lasting, shelf stable hot dog! BTW Thank you for all you do Chuck. Your my go to for dinner! These are the bomb! I cannot believe how much they taste like hot dogs. My entire family loved them. The only thing I changed is that i did not peel them. I think just scrubbing them gives them a better texture and closer to a hot dog “skin”. Also, I made a big batch, marinated for 6 hours, dried off the marinade and froze them laying flat in a freezer bag. When I was ready to make them I just threw a few in the fridge a few hours before to defrost then grilled them and they were just as good as fresh. Thanks for the killer recipe! Well what a great surprise. I followed the recipe to the letter and made/marinated then bbq them all (5 in total). My wife ate one and loved it. I was planning on eating two, but ended up eating the remaining 4, they are great.